On 1 May each year the Berliner Philharmoniker gives a concert in a different European city. The purpose of the concert is two-fold: to mark the anniversary of the orchestra’s foundation on 1 May 1882 and, as it is stated in the booklet, to celebrate “a common European heritage and [to] emphasise the unity of the continent and its cultures.” In 2015 the orchestra travelled for the second time to Athens to stage this concert; their previous visit there had been for the 2004 Europakonzert (review). That 2004 concert was given in the ancient outdoor arena, the Herodes Atticus Theatre, built in 161 AD. The 2015 concert was given in a modern indoor venue, the concert hall of the Megaron. This appears to be a splendid, spacious hall, offering excellent sight lines to a substantial audience. I don’t believe I’ve ever heard or seen Sir Simon Rattle conduct Rossini. He seems to enjoy the Semiramide Overture very much and with alert, stylish playing from the orchestra this makes a vivacious curtain-raiser. The choice of concerto is appropriate because the concert was given during the Sibelius 150th anniversary year. It was a graceful compliment to Greece to engage Leonidas Kavakos as the soloist but more than that it was an entirely logical choice because he and Sir Simon had given the concerto together earlier in the year. They played it, for example, as part of Rattle’s Sibelius cycle in London with the Berliner Philharmoniker. 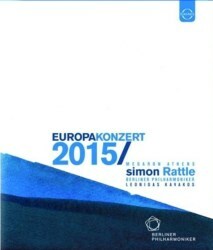 It’s good to have this performance alongside Rattle’s recent symphony cycle (review). Kavakos is a noted exponent of the Sibelius concerto and I’ve long admired his recording with Osmo Vänskä (review). The value of that particular disc was enhanced significantly through the inclusion also of the concerto in its original version. So far as I know that’s the only recording of that version. Here Kavakos offers the familiar published score. I’ve heard him play many times but I’ve never seen him in action. I was struck by the fact that there’s nothing flashy or distracting about his style. Rather he plays in a way that is physically quite restrained. I welcome that very much. He gives the appearance of a studious professor and I don’t mean that in any way unkindly. As for his playing, it’s primarily poetic and his tone seems ideally suited to this music. Though he doesn’t seem as physically driven as some of his peers there’s no lack of intensity in his delivery of the music and he brings off the dramatic passages very well. He receives terrific support from Rattle and the orchestra in a performance that I found enjoyable and involving. For an encore he gives a serene rendition of the Largo from Bach’s Third Sonata for solo violin. During this I noticed Sir Simon sitting unobtrusively on one of the platform risers, next to the horn section, listening intently. The programme ends with Schumann’s Rhenish Symphony. There’s another filmed performance of this work by Rattle and the Berliner Philharmoniker in their complete set of the Schumann symphonies, which I admired very much (review). This Athens reading is just as good. The first movement is full of dynamism, the horn section in fine fettle. The rendition of the third movement is marked by tremendous finesse in the playing of the whole orchestra. I like very much the grandeur and tension that Rattle and his players bring to the fourth movement while their account of the finale is happy and full of brio. I’m unsurprised that the Athens audience was clearly delighted. This is a most enjoyable concert. The Berliner Philharmoniker is on top form and Rattle conducts with his usual mix of flair and attention to detail. As I’ve noticed on several films of concerts he clearly takes huge pleasure in the virtuosity and great musicality of his orchestra.. The visual and audio presentation of the concert is excellent.